Also from the AQ Hayon Collection, are tables, lamps, sinks, mirrors and more. There is something so gorgeous about these sleek stiletto like silhouettes that i can’t stop looking at, especially in the lacquered black and silver against a matte white. And the mirror… love the ornate yet simplistic feel of all of these pieces… something strangely delicate about them. ArtQuitect is “the pioneering company disseminating bathroom culture in Spain.” This Bathtub is a part of their AQHayon Collection, by designer Jaime Hayon - an incredible Spanish product, toy, graphic designer. But this post is really to feature this AQ Hayon bathtub that i’ve been obsessed with all weekend. Something about the sleek black and white lines that is irresistible, almost makes me want to design a house or bathroom around this piece alone. More imagery below. Asvetic posted this to .org earlier this week, and i found myself showing it to so many people, it needed a post here for anyone who missed it. Remember the Baby Suit? Well that was apparently the work of the incredible London based Mr. Toledano, from his Hope and Fear set. View the full Video Gamer Faces set as well! All of his imagery manages to capture such a frighteningly realistic surreal view of humanity. Wow, is the Fiat 500 really getting a retro makeover? How very mini-like. I have an on going love affair with the classic fiat cinquecento… my first time in Milan, i was wandering the Duomo square one sunday morning and there were HUNDREDS of classic cinquecentos filling it. It was AMAZING to say the least, ran off to find a disposable camera, or ANYTHING (this was before i learned to carry cameraphone, waterproof digicam, and the rebel around)… came back and they were all GONE. I wasn’t dreaming, i just happened to catch the last half hour of the Fiat 500 Club meeting. It was completely surreal. 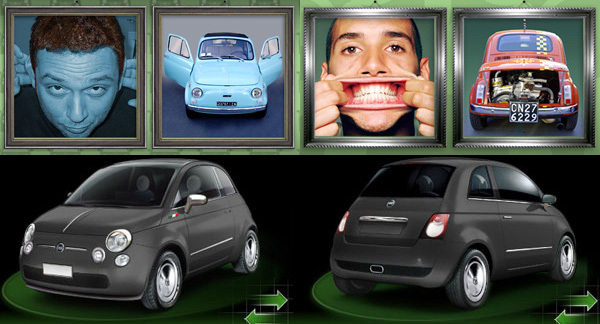 So, i’ve spent this morning indulging in all the toys over at the Fiat 500 countdown site (only 314 days left!) Where you can design your own, even submit your own ideas to them… and check out DesignBoom’s competition with them… judges are giorgio armani, fashion designer, luca cordero di montezemolo, president of the fiat group, jasper morrison, industrial designer, gabriele salvatores, film director, and luca trazzi, designboom. I might be too giddy to post this post. Photomontages AND Genevieve Gaukler? *swoon* Her latest exhibition details: “16 artworks made for the exhibition I hold at the Someday Gallery in Melbourne. 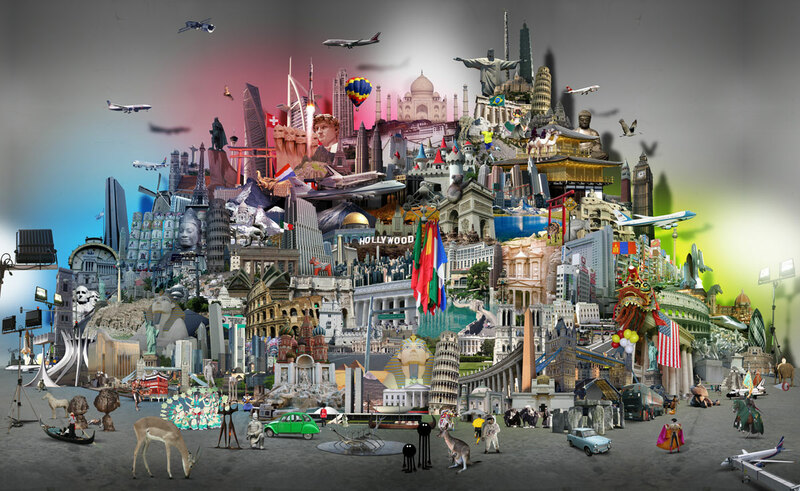 So exciting to make these large photomontages, such a huge amount of work also, cutting out around 3000 photos!” See my favorites below, and/or click through the series here. You’ve been hearing that wearable tech will be the next big thing for a while now, and some impressive design projects come out, but its certainly not something we see/use everyday yet. On the forefront of wearable electronics, Oakley’s Thump 2 and O Rokr have made some waves, and after hearing all the hype and grumbles, we have a pair of them in the studio… (lots of pictures of packaging, details, etc below!) - and they are really fun. With the holidays around the corner, these definitely fall into the category of perfect gifts for the active tech savvy one that has everything… The Thump 2 I’ve tried out holds up to 1gig of music, top secret files, etc. (connects via USB). The O Rokr is the Oakley/Motorola collaboration which “gives you absolute wireless freedom, digital stereo fidelity and patented optical clarity.” in other words it’s both your bluetooth headset and streams music from your ipod, while still having the high quality of Oakley’s optics. More below for my impressions of the two. “Computers as a new religion… Oh Maria Keep my data safe! A USB Virgin that you plug into your computer and hope for the best.” 2004 RCA Student project by Luis Esalva Aloy is too funny. I’d keep her between my Mimobot and my parking goddess. As much as i love Tord Boontje’s vectory tendrils of naturally inspired goodness, the Blossfeldt Fractals d*s featured today blew me away. Something about science and art merging perfectly grabs me. 1920’s-1930’s photography meets a brilliant algorithm is simply gorgeous… “Blossfeldt Fractals are a dynamic composition of plant forms, based on photographs by Karl Blossfeldt, and generated through algorithms similar to Lindenmayer System.” Truly incredible are HOW this is accomplished, see below. Great video walking you through his process as well as the gallery. As if we don’t have enough complexity in the day to day? Love this diagram that SwissMiss pointed out from &Partners’ Process Page. I know i’ve told you about the Wee Ninja before, as well as ThisNext (the tags down at the bottom of the page, my consulting for them, Digital Life, etc) ~ but here’s one of those exciting design/shopping related stories i had to share! I’ll put it out there, i’ve had my doubts about how social shopping and recommendation sites would really impact designers and smaller stores that we love to feature here at NOTCOT. So check out the latest NYTimes article on “Word of Mouth” Shopping… particularly ThisNext’s impact on Shawnimal’s Wee Ninja. “It’s been a big start to the holidays for Shawn Smith, his wife and creative partner, Jennifer Brody, and their Wee Ninja doll. Ever since the third week of August, when the new social shopping site ThisNext.com spotlighted the Wee Ninja — “Can’t resist his tractor beam of cute,” wrote one contributor — the couple have been unable to make enough of the cuddly black dolls with the cream-colored faces. So let’s just say that this story just makes me light up (esp since i’ve been in love with the wee ninja since July 2005… and will it surprise you that i was the first of 18 recommendations of the little guy? )… and i have renewed faith in Social Shopping. So go recommend your favorites and use your power of word of mouth, because Holiday shopping is around the corner, and it looks like this is the best way to support your favorite designers/stores in addition to buying from them! How would you label/categorize your work? Somewhere between romantic and technological. What item (PC, pen, etc) can you not do without when you are designing? For the first bit, I do not need anything at all, I can do it inside my head. For the next part of the process I need my complete studio which is as large as an airplane hanger and houses a team of 6 people, machines, tools, computers and stuff. It is all essential, and seems to becomes more every day. Oh, and the coffee machine is important. 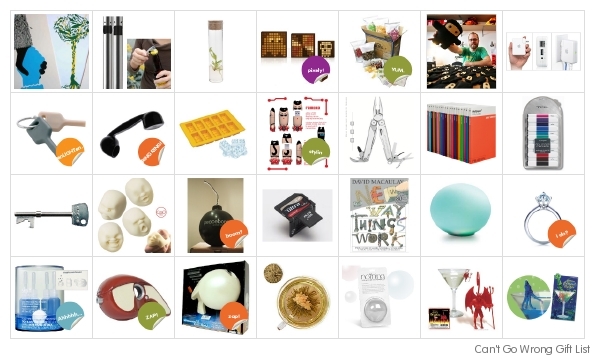 And on target… “Besides the products, we have made store decorations for all 1,500 stores, the graphics for all catalogues and collaborated on the art-direction of the TV commercials.” Wow. Now i need to go to target just to see this! “In a time where identity is cause for prejudice, and individuality is sacrificed to the mind-numbing power of the Gods of Generic, new champions will emerge, bearing with them hope for an increasingly faceless world.” Can’t you hear that as a voice over to the latest network tv show? I think these guys can take on Heroes. Newest line from Podstar (see NOTCOT Review) are these Diablo Spectrum skins ~ add some colors to your ipods! With names like Matadork for the red with lime green wheel, you can help but smile as you roll over them.